KUALA LUMPUR (March 8): Chin Hin Group Bhd shares rose as much as 18.5 sen or 28% to become Bursa Malaysia's top gainer. Shares of building material manufacturer Chin Hin rose to 83.5 sen before paring gains. At 10:16am, the stock was traded at 81 sen with some 87 million shares changing hands. 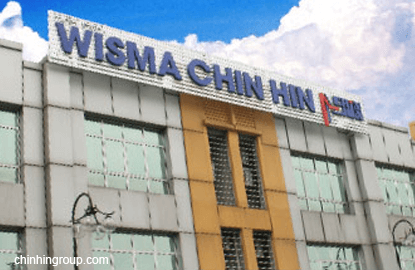 Earlier, Chin Hin shares opened at 81 sen versus the stock's initial public offering (IPO) price of 65 sen.
Chin Hin's IPO entailed a public issue of 63.2 million new shares and an offer for sale of 65 million existing shares at 65 sen each. At 65 sen, Chin Hin has a market capitalisation of RM328.83 million. The market value is based on the company's expanded issued share base of 505.89 million shares. Speaking to reporters after Chin Hin's listing ceremony here today,group managing director Chiau Haw Choon said the company was expecting double-digit net profit growth in financial year ending Dec 31, 2016 (FY16). Chiau said Chin Hin would see "significant" growth in FY16, driven mainly by its manufacturing division. Earlier, Chin Hin told Bursa Malaysia that FY15 net profit rose to RM30.22 million from RM30.19 million a year earlier. Revenue fell to RM1.2 billion from RM1.22 billion.